Did you miss the Open House on November 14th? The second Study Open House reviewed existing and forecasted conditions, provided opportunity to weigh in on the corridor vision and goals, and presented potential corridor and intersection improvements. If you were unable to attend you can view the meeting boards here or take a look at the draft layout. 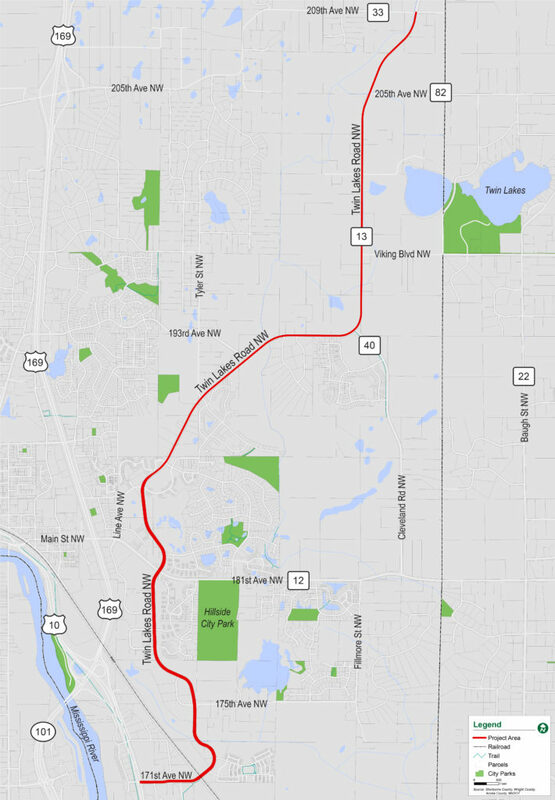 Twin Lakes Road (CSAH 13) serves as a vital transportation link supporting economic and social well-being locally, in Elk River, and in the region. Regional traffic growth, improvements on Highways 10 & 169 in Anoka and Ramsey, residential growth, and continued commercial and industrial development will all put traffic pressure on this corridor. The Twin Lakes Road (CSAH 13) Corridor Study will be used as the framework for guiding Sherburne County and the City of Elk River as they address issues and make improvements along the corridor. This study will identify current and future conditions, develop technically sound solutions to proactively address issues, and recommend projects to implement solutions in a fiscally responsible manner. Please enter your preferred contact information below. Site developed and maintained by Bolton & Menk, Inc.